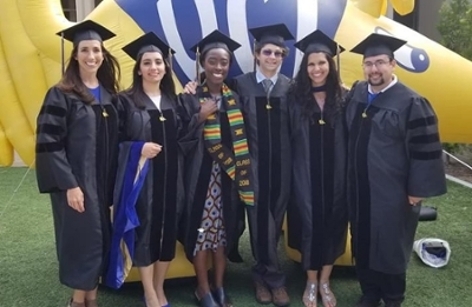 Pictured from left to right: Kristin Hirahatake, Ph.D.,Clara Ziadeh, Ph.D., Teofilia Acheampong, Ph.D., John Schomberg, Ph.D., Avital Fischer, Ph.D., and Daniel Nuyujukian, Ph.D. Please join us in congratulating our 2018 Epidemiology department graduates! Any graduate program is no small task to complete. We are incredibly proud of our students and everything they have accomplished during their time at UC Irvine. All the best in your future endeavors. Go Eaters! Zot! Zot! Zot!